Have You Seen George W.Bush In Tears Before? You are here: Home / Life, Food & Thoughts / Have You Seen George W.Bush In Tears Before? 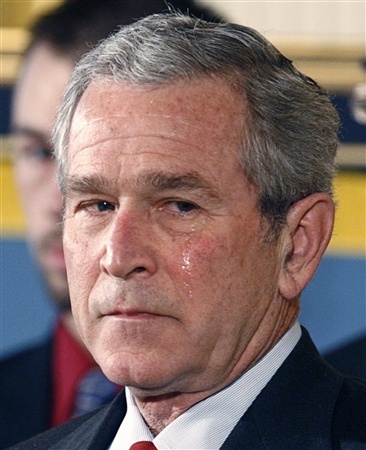 Seriously, it was really my first time seeing Mr. Bush in tears. Tears run from the eyes of U.S. President George W. Bush during a ceremony in honor of Medal of Honor recipient Marine Cpl. Jason Dunham in the East room of the White House in Washington, January 11, 2007. Cpl. Dunham was killed when he jumped on a grenade to save fellow members of his Marine patrol while serving in Iraq. My personal condolences to the brave soldiers.